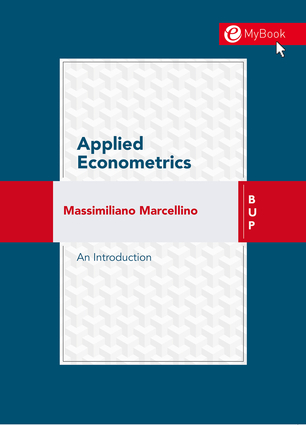 The goal of the book is to facilitate both teaching of applied econometrics, particularly in undergraduate and Master courses, and learning by students or those concerned with a formal measurement of economic events. Statistics is needed for a correct formulation of the problem and interpretation of the results, but an excess of formalization may discourage students. For this reason, the statistical content of this book is rigorous but limited to what is strictly necessary for a proper application of the methods. All theoretical concepts are then illustrated empirically, with examples that use either simulated data, in order to have a more immediate and controlled feedback, or actual data on economic variables. The software used is EViews, usually available in academic computer rooms or otherwise at an affordable price. Each chapter begins with the necessary theoretical background, continues with the practical applications based on simulated and real data using EViews, and concludes with a summary of the main concepts developed in the chapter and with both theoretical and applied exercises as a way to test and improve learning. Massimiliano Marcellino is professor of Econometrics in the Economics Department of Bocconi University, fellow of CEPR and IGIER, and Scientific Chairman of the Euro Area Business Cycle Network (ECB-Eurosystem-CEPR). Previously, he held the Pierre Werner Chair on the Monetary Union at the European University Institute, where he was also Director of the Department of Economics. He is currently an editor of the Journal of Forecasting and the coordinator of the European Forecasting Network.